On a cold but sunny afternoon, just before Christmas, the choir, along with Jonathan, gathered in The Orangery at Barton Hall. We had been asked to sing at a wedding! The guests duly made their way in, followed by the groom and best man, looking extremely elegant. Then the moment everyone was waiting for arrived. A white limousine delivered the bride and bridesmaids to the door, and they entered the Orangery. The bride looked stunning! The guests, in high spirits, joined in with our singing, as requested by the bride, and were very appreciative with shouts and applause. When asked if anyone knew of any just cause why the couple should not be joined together, a baby caused uproar by choosing that moment to cry out. As the couple prepared to leave, one of our newer members, Sarah, led everyone in "All I Want For Christmas is You" and earned herself a big cheer. The choir continuted to sing Christmas songs whilst the photographs were being taken, even though space was at a premium. However, in true Seagrave Singers style, we soldiered on. All in all it was a lovely occasion (if a little chilly) and hopefully we helped to make the day a memorable one for the happy couple. Once again, choir member Kay arranged for the choir to sing Christmas Carols in the Kettering ASDA store. This we did over the lunchtime period, greeting customers who were in the middle of their pre-Christmas shopping. Family members of new choir recruit Carol were among the shoppers, and it was lovely to see their smiling, happy faces. We dressed in Christmas jumpers and choir fleeces, so we would be warm standing near the door. To add to the fun we also wore an array of jolly Christmas hats (some lit). Jonathan lead the choir and Gill played the keyboard. This year our bucket collection was for the Kettering-based charity "Johnny's Happy Place". It was a delight to be supporting a local cause. We sang from a handbook, organised by choir member Steph, as well as singing Christmas songs from our repertoire. The shoppers particularly liked our version of Frosty the Snowman!! During our break we were supplied with hot drinks and biscuits by ASDA, so we were suitably refreshed for the second half. Performing here certainly got the choir into the Christmas spirit.....and hopefully the shoppers too. 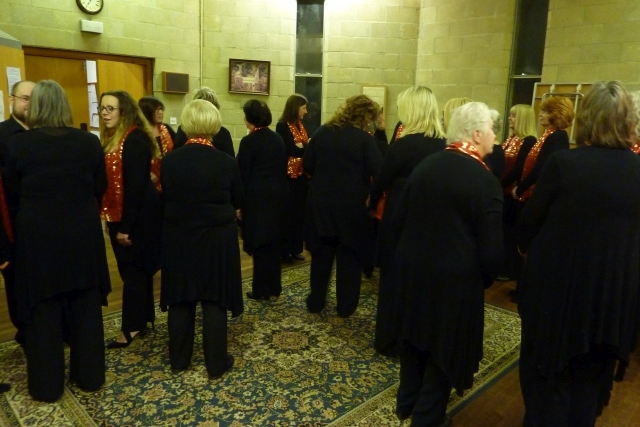 Following an invitation, on Tuesday evening the choir sang at the Christmas party of the Sywell Womens Institute. We were engaged to entertain the ladies following their evening meal. We had been asked to join them for the meal and many of the choir members joined them before we gave our performance. It was a lovely meal, and for choir members who chose not to eat "supper" there were Christmas nibbles to enjoy. 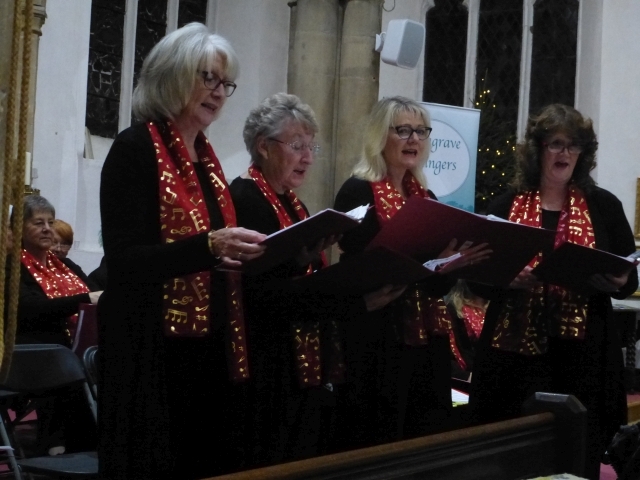 We sang a mixture of songs and carols from our Christmas programme and they were well received. Communal singing of carols chosen by the WI members followed this. It was a lovely relaxed evening and we received many compliments as we left the ladies to continue with their partying! What a start to our Christmas concerts. Nerves settled, Jonathan smiling, and a great intro from our entertaining and relaxed compare, Simon Lindley, we offered a varied programme. This included readings, duets, quartets. sextets and a couple of "audience participation" carols. The choir sang traditional carols, some light hearted fun numbers, including a radio favourite, "Fairytale of New York" originally by the Pogues back in the 80's. We were also delighted to present "Away In a Manger" and "Hark The Herald Angels Sing", both new arrangements written by none other than our MD. Our chosen charity, Johnny's Happy Place, sold raffle tickets and the many prizes on offer hopefully raised a significant amount of money. During the interval refreshments and nibbles were available for all........the choir needed sustenance after all!! And let's not forget our budding cameraman and helper Ronan who did an amazing job throughout the night. And of course, our brilliant pianist, Jill. The evening all too soon over, all our rehearsing put to good use. We ventured home, tired, exhilarated, reflective.....and looking forward to our next concert. Roll on Tuesday evening and our concert for Sywell WI. Tonight, in aid of the Royal British Legion, The Poppy Concert at The Plaza, Thrapston was extremely entertaining. 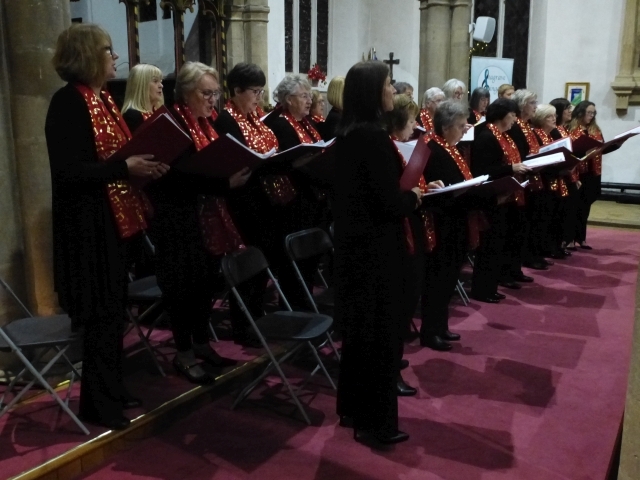 There was joyous singing from the Seagrave Singers to and apprciative audience. All the Seagrave Singers had been looking forward to the chance to perform for such an important cause and show our support. All the hard work paid off with a varied programme and some beautiful solos. Early on Sunday morning the choir travelled by coach to New Buckenham in Norfolk for a joint concert with New Buckenham Silver Band. It was a beautiful sunny day and we were able to enjoy the lovely Autumn colours of the Norfolk countryside as our driver negotiaited the sometimes narrow, country roads. We arrived in plenty of time to enjoy our packed lunch and a cup of tea prior to the afternoon concert. The programme comprised of well known band marches, items from better known musicals, songs from the "Swing" era and a little Gershwin. The band and choir joined forces for a rendition of "Don't Sit Under the Apple Tree", arranged by Jonathan, our musical director. To end the concert the audience joined the choir and the band in a rousing "Hootnanny". In the pleasant setting of Grafton Underwood Church on a Friday evening we perfromed a varied programme in front of about eighty appreciative people. This was a return visit, and one audience member said it was the best concert he'd been to there. 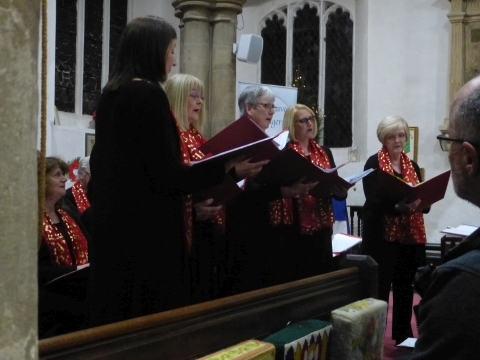 Our programme included songs from the musicals, the "Oliver Medley" being particularly well received, there were spiritual songs, and choral pieces by the well known composers John Rutter and Bob Chilcott. There were five soloists and one reading. The highlight of the evening, apart from our fine performance, was a free glass of wine for choir members! And a happy face from Jonathan after (most of) the songs. Gill, our accompanist, likewise performed very well. It was on a Thursday afternoon the choir went to sing at Christ the King Church, in Kettering, as part of "Holiday at Home". "Holiday at Home" is a week long event full of activities, talks and entertainment for people in the local community. Around twenty members of the choir were able to attend, but we did miss those who had to work.... or were otherwise engaged. We sang a variety of songs, which seemed to go down very well with the audience, as well as Jonathan's dad! Afterwards we were able to meet some of the audience and share refreshents with them. The cakes were especially appreciated! A great vote of thanks needs to go to choir member Lesley for stepping in to accompany us so ably. Standing in a colourful flash of bright pink we took our places to open this year's KettFest celebrations. The Kettering Town Cryer cheerfully (and loudly) announced our opening song, "Somewhere Over The Rainbow". The weather was warm and no rainbows in sight, but the song was certainly received well by the by-standers who had stopped on their busy Saturday morning in Kettering. The Seagrave Singers, being a four part ladies choir, meant there was a lot of good-humoured banter on the small area provided at the Kino Lounge. As the familiar notes soared through the air, we sang "The Hills are Alive with the Sound of Music" and shoppers stopped, to take the weight off their feet and listen to our tuneful melodies. Certainly we received an appreciative round of applause by those who had gathered to listen. While we sang the medley "Saint's Go Marchin'" there was much foot tapping and clapping from the public. When we had finished our "set" Jonathan, our Musical Director, decided there was time for an encore, and in a beautiful sea of pink and musical notes (scarves) we rose to the occasion! A fantastic start to our 2018 season. With our new MD and Accompanist, the choir performed at Moulton Theatre on Friday 21st May. The choir were invited by members of Moulton Players to perform “Songs from the Shows” in their auditorium, as part of their monthly social evening. The choir thoroughly enjoyed performing in this grade II listed, converted Methodist Chapel, as the performance had a very special and intimate feel to it. The auditorium only seats 68 people. A variety of musical medleys were sung, including Broadway Blockbusters, Oliver and Les Miserables, The Sound of Music and You’ll Never Walk Alone. Our two soloists sang beautifully; Rosemary - “Someone Like You”, from the show Jekyll & Hyde and Alison - “If I Loved You” from Carousel. We ended with the song Cabaret as an encore. After the performance the audience joined in a quiz to try and guess the names of the shows the songs were from. The choir were made to feel very welcome, and after singing and standing for nearly 1 hour, appreciated the refreshments and a cheese and biscuit supper the Theatre laid on for them. A successful and enjoyable evening was had by all and definitely a venue we would like to go back to. Last month Seagrave Singers were able to present a cheque for £1000 to Kettering Samaritans. This was a result of fundraising to support the local branch of a national charity. 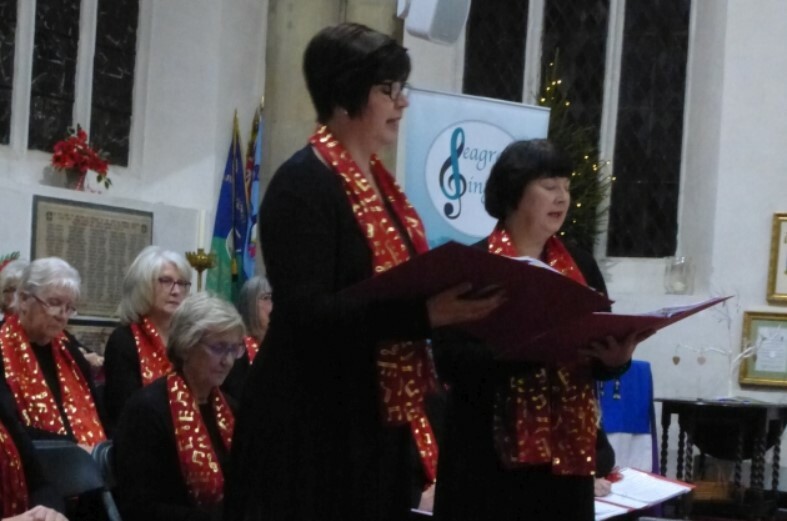 Our biggest fund raising event was our Christmas concert held at St Mary's Church, Burton Latimer last December, that certainly seems a long time ago! The Samaritans rely on donations to support the amazing service they offer. The Kettering branch of the Samaritans is based in Montagu Street and offers a face-to-face service in addition to telephone support. They also have an outreach team. We were delighted to make this donation to such a worthy charity and wish them well for the future.